After having studied at the Darius Milhaud Conservatory of Aix-en-Provence together with Jacqueline Courtin and Bernard Flavigny, he was admitted to the National Superior Conservatory of Paris for Music and Dance where he took classes with Geneviève Joy, Jean Hubeau, Christian Ivaldi and Dominique Merlet. In France he has also worked with: Carlos Roqué Alsina, Alberto Neuman, Evgeny Malinin. In 1986, a scholarship allows him to study in the Moscow Tchaikovsky Conservatory where he gets some good advice from Henriette Mirvis, Samvil Alumian, Mikhail Vosskressensky and Lev Naoumov. The same year he won a prize in the First Franz Liszt Piano Competition in Utrecht. Michel Bourdoncle has an active concert career and regularly performs at top venues all over the world: Carnegie Hall in New York, Sala in São Paulo, Teatro Municipal de Rio de Janeiro, Great Hall of Moscow Tchaikovsky Conservatory, Anichkov Palace in St Petersburg, Sala Verdi in Milan, Weinbrenner Saal in Baden-Baden, Teatro Real in Madrid, Salle Gaveau and Théâtre du Châtelet in Paris, Toursky Theatre in Marseille, the Montpellier’s Corum, Salle Paderewsky in Lausanne, Grande Salle of the Royal Conservatory of Brussels, the Ljubljana Castle, the Philharmonic Theatre of Odessa, the Chisinau Philharmonic, the Bucharest Radio, the Philharmonic orchestras for Cluj-Napoca, Lasi, Timisoara, Craiova and Bacau, Smetana Hall in Prague, the Suntory Hall in Tokyo, Beijing Poly Theatre, the Shanghai Grand Theatre, Mahidol University in Bangkok, Hanoi Grand Theatre. Michel Bourdoncle has performed with: Geneviève Joy, Luba Timofeveyeva, Sa Chen, Cristina Anghelescu, Marianne Piketty, Cécile Perrin, Erick Friedman, Florin Ionescu-Galati, Pierre Hommage, Francis Duroy, Olivier Charlier, Mark Peskanov, Yuri Bashmet and the Soloists of Moscow, Kirill Rodin, Stephen Kates, Dominique de Williencourt, Frédéric Lagarde, Philippe Cuper, Giampiero Sobrino, Jean-Marc Boissière, Amaury Wallez, Dang Thai Son, Konstantin Lifschitz, Jacques Rouvier, Georges Pludermacher. He has also performed with the following quartets: Via Nova, Manfred, Élysée, Johannes, Transilvanien, Camerata de Varsovie, Archimède, Amazonien, Debussy… He is the dedicatee of works by many composers including Carlos Roque Alsina, Nicolas Bacri, Tristan Patrice Challulau… He has recordings with Doron Music, Ems Master Sound, Naxos Marco Polo, 3D Classics. 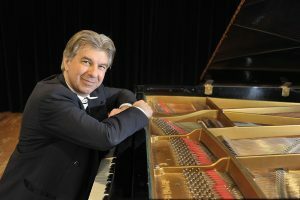 From 1981 until 1991 Michel Bourdoncle has worked as accompanist for the National Superior Conservatory of Paris for Music and Dance. He also taught piano at the National Superior Conservatory of Lyon for Music and Dance, and chamber music at the regional Conservatory of Marseille. Since 1987, he has been teaching piano at the Darius Milhaud Conservatory of Aix-en-Provence. He has organized master classes in numerous countries and has been featured on various radio and TV shows.